This was the statement that I wrote out at the beginning of the Poetic Art workshops that I facilitated in Gulu, Northern Uganda for war-affected youth. Having lived through a more than 20-year devastating civil war, with the rebel group the Lord’s Resistance Army (LRA) and government forces the Uganda People’s Defense Force (UNDF), these youth were in need of a way to express their emotions and thoughts about the experience of war. 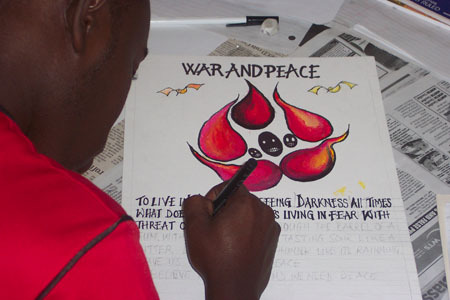 In addition to expressing their emotions and thoughts, this group of 18 youth aged 19-27 wanted to use Poetic Art to mobilize other groups of youth to creatively use art and poetry as a tool of expression to engage the community with peacebuilding messages. “At times there are youth or children who may not easily express their feelings about conflict. By using this approach, we can have them draw or write about their feelings. The things you draw are the things in your mind — a person like me who has grown-up with this conflict for 20 years would draw images that reflect the conflict. I think that using art is an even more effective way to communicate messages because you can interpret a deeper meaning from art which stays with you — unlike words which are spoken and often forgotten. 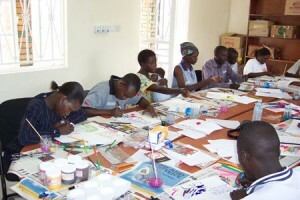 An art and poetry workshop was done in a similar manner in Karonga, Malawi. Twenty-one youth were brought together for a 1.5-day workshop focused on how art and poetry can be used in HIV & AIDS-affected communities to enable youth to express their emotions and also to communicate educational, positive messages. To find out more about international Poetic Art workshops please contact Roxane Tracey.